What a crazy few weekends! A group of 12 ETC students and myself participated in the Pittsburgh 48 Hour Film Project, in which we were tasked to make a film between 4-7 minutes that included a given character, piece of dialogue, and prop. Check out the results below! My newest project at the ETC, Digital Dream Lab, is now up and running! Our client is Makeshop, a group at Children’s Museum of Pittsburgh, which focuses on getting visitors of all ages to learn by make things with their hands. They’re looking to integrate helping children to learn how to program in the space, so we’ve come up with a tangible block system that translates to a projected animation, so young children can learn and understand the basic organization of a computer program with their hands. I’ve been appointed as the Art lead and I’m excited to get to flex some of my design muscles from my undergraduate career, both from the Media Lab as well as the Architecture department working with visual programming and tangible blocks! We’ve just finished our fourth week, which means we’re about a quarter of a way through our project. 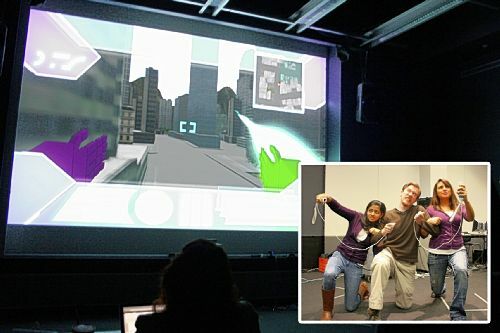 Check out our progress at our website, http://etc.cmu.edu/projects/digital-dream-lab! Last night was the Fall 2011 BVW show, and it was amazing! We got to see a lot of different technologies and some great experiences created by the Fall BVW class this year. Two of my worlds were accepted into the show: ElectroTechnoCorps (performance from our second interim presentation can be seen below) and Balloon Tower Princess Rescue! To watch a feed from the show, you can download it here and read more! The Pittsburgh Post-Gazette also did an article on the show, available here.